Congratulations to Westwood Baptist Church, University Center! On this past Sunday, October 26, 2014, I had the joy of going back to my adopted church home, the Westwood Baptist Church, University Center in Nashville, Tennessee, where Minister Barton Elliott Harris is the senior pastor, as they celebrated their 94th Church Anniversary. Jessica and I were joined by the people of First Baptist Church, Frankfort, KY, who made the trip from Frankfort to Nashville and what a time we had! In worship, the Men of Praise of FBC sang and the WBCUC Fruit of the Spirit dance ministry performed. The Spirit of the Lord was, as the saints of old used to say, “was high” and from Praise to Worship to Benediction, God’s spirit was moving. The Lord “was kind” to the preaching moment. I preached from Revelation 3:8 with the subject, “The Doors of the Church are Open.” God blessed Westwood with the addition of two new members. God be praised! I have a very special warm spot in my heart for Pastor Harris and Westwood. After pastoring on the West Coast for over 15 years and experiencing a painful, wounding transition in ministry, it was this pastor and congregation that ministered me back to spiritual health. I became introduced to Westwood by one of their associate ministers, Minister Brian K. Wilkins, who knew me through my internet ministry. At the time he was over the Men’s Ministry and they brought me in to do a Men’s Revival during the summer of 2005. After preaching there for a weekend, Pastor Harris called me to ask me to come back and preach for their Church Anniversary. During the call he extended to me the idea of becoming his second full-time assistant pastor. My job description was complimentary to the other assistant pastor and he flew me to Nashville to discuss the matter face to face. At the conclusion of our meeting and after prayer, I agreed to accept his gracious offer and as of October 1, 2005, I began my ministry as Assistant Pastor of Westwood Baptist Church, University Center – my first time living somewhere other than the west coast. Admittedly, it was a culture shock. People from the south take church differently than on the west coast. I had never been a part of what was a literally 7 day a week congregation. Every morning at 6:15 a.m. and 7:15 a.m., prayer was held at the altar. I had never seen such a large Vacation Bible School and seen the kind of planning and investment. I had never witnessed a pastor who was comfortable in his skin to share his pulpit with two assistant pastors and a plethora of associate ministers. It was a teaching and learning environment and I learned more about pastoring in four years than I had ever in my life. Pastor and First Lady Carolyn Harris modeled what a Christian marriage looks like and it made a tremendous impact upon me and my wife, Jessica. Jessica and I were engaged during the summer of 2005 and while we were making wedding plans, I was candidating at congregations in Richmond, CA, Oakland, CA, and Stockton, CA – however, God had other plans for us and after I had driven/moved across country to Nashville, I flew back to California for the wedding on October 22 and after our honeymoon in Reno, Nevada, we flew to begin our new life in Nashville. I was faithful at Westwood. Never complained publicly. Never took issue with leadership, because I knew the secret of leadership – a leader follows and then becomes a leader. Pastor Harris gave me tremendous opportunities. He entrusted me with the Mid-Week Adult Bible Study (after 100 students in the class), the Young Adult Sunday School class, VBS (photographer), Graphic Art flyers, leadership of the Men’s Ministry, leadership of the Evangelism Ministry (and we set a record by the help of the Lord and He added 100 new members), and then finally, I became the music director for the Men of Praise Choir, which grew from a handful to a choir stand full. I enjoyed the MOP and we rehearsed every Wednesday evening after Bible Study. I consider these men my dear friends even to this day. Westwood was organized in 1920 in a small storefront building on the corner of an alley between Albion and Alameda Streets at 26th Avenue North. As they grew, they called their first pastor, Rev. James Tunstill in 1920. A succession of pastors followed including Rev. S.M. Wright (1922-1924), Rev. J.H. Lawrence (1925-1928), and then the church proposed under the leadership of Rev. Ambrose Bennett, who was a major religious and civic leader in Nashville. After his passing two American Baptist Theological Seminary students served – Rev. W.O. Wells (1957-1959) and Rev. Alphonso R. Blake (1959-1960). Rev. George W. Brown (1961-1965), Rev. J.W. Watkins (1965-1969), and Dr. Amos Jones (1969-1986), who led the church in acquiring properties, revolutionaztion of Christian Education and Missions, and building its current edifice. On December 1, 1987, Pastor Harris returned to Nashville from Boston, MA, to become the current pastor. He was reared, baptized, licensed, ordained and married at Westwood. Under his steady and prayerful leadership, Westwood has grown exponentially. Now Westwood is a major landowner in North Nashville, having purchased 20 different properties and currently rents 22 units inclusive of homes, duplexes, and apartments. The Church has expended its physical plant to include the West (Brick) Annex (where my old office was located), the East (White) Annex and the Youth Annex – each housing offices, classrooms and meeting rooms. Westwood has completed 94 years. There are continual plans for modernization and what I learned most of all at Westwood was to continually evolve. They taught me that hard times and difficult days should never stunt your growth, but enhance it. I thought it was a really stupid joke. Many of us, who first heard of this through the medium of social media (because you only hear about ebola on my major cable news outlets) passed a gem on, initially, that said that the Mayor of Houston, Texas, Annise Parker, had subpoenaed sermons from four pastors regarding sermons, preached across their respective pulpits, on the subjects of homosexuality, gender identity or on the mayor herself. Further, that any of those ministers who failed to comply could be held in contempt of court. I thought it was a faux Fox News Story. I look at Fox News like I look at a fun house. Lots of clowns, shooting canons and mirrors, and of course, all anti-Obama all the time news coverage. When I saw Fox News’ brand on the report, I dismissed it as a gag and joke. But then, more of us started digging into the story and found out – it was true. The subpoena was the result of a lawsuit filed by Pastors Jared Woodfill, Steven F. Hotze, F.N. Williams, Sr. and Max Miller against the Mayor, the City Secretary (Anna Russell) and the City of Houston. The subpoenas target five pastors in Houston – Pastors David Welch, Steve Riggle, Khan Huynh, Magda Hermida, and Hernan Castano. The lawsuit was filed due to their opposition to an ordinance known as HERO (Houston for Equal Rights Ordinance” which bans discrimination among businesses that serve the public, private employers, in housing and in city employment and city contracting. A petition drive was enacted (17,269 signatures were required for ballot approval and 50,000 signatures were submitted) and the city ruled thousands of signatures ineligible and did not place the contesting item on the ballot, triggering the suit by the ministers. This is wrong on so many levels. First off, there is no precedent in American Jurisprudence that allows a municipality to sue or contest a congregation or a pastor on the basis of their speech. I will agree that some pastors are loose canons or suffer from preaching a gospel that is not in print – HOWEVER, even dumb speech in this country is protected speech. Even speech that I may not agree with still is protected by our U.S. Constitution, which gives no authority to a Mayor to subpoena SERMONS. This seems, to me, to be extra-constitutional. The outcry from Pastors and Ministers across the country is defeaning (oddly, I’m yet to hear or read of any official statements from any of African-American Christian conventions, although at least two of the suing ministers are black and baptist). The right to preach is sacred in this country. This nation which has produced orators, revivalists, prophets, and encouragers has also produced crazies, idiots, flimflam artists, bigots in robes, as well. However, it is all protected free-speech. I may not agree with what you have to say, but I have to understand that you have the right, if it’s your pulpit, to espouse it. It may not be pretty, but it’s how things are done in this nation. The Mayor has been doing spin control. But this may be too little, too late. She began to blame her opponents for the broad original language to “deliberately misinterpret the city’s intent.” City Attorney David Feldman called it “a media circus.” But in this case, the circus did not come to town, the city by subpoena, brought the town to the circus. This post is not to comment upon the HERO ordinance. (I don’t live in Houston, I live in Kentucky) No, my goal is to enlighten and condemn the city of Houston for coming after ministers and demanding their sermons. Religious beliefs are protected beliefs, even when they are considered anti-government. Our own Dr. Martin Luther King, Jr., Dr. Ralph David Abernathy, Dr. William Augustus Jones, and other ministers rallied against policies of the government including war, poverty, racism, etc., but not once was a city municipality so stupid to request copies of their sermons, as if to send out a “warning shot” to other ministers, don’t try this in your pulpits. It may not be the intent, but it is the appearance. Updated October 10, 2014 – 7:00 p.m.
COLUMBUS, OHIO – One of Columbus’ senior sages has entered into eternal rest on Tuesday. The Reverend Dr. G. Thomas Turner, pastor of the Friendship Missionary Baptist Church went home to be with the Lord on October 7, 2014. He was born on Christmas Day, Friday, December 25, 1936 and passed away at the age of 77. Dr. Turner was the third pastor of the Friendship church in the 92 year history of the congregation. He pastored there for over 41 years, after being called in September of 1973. His grandparents had served in the church – his grandfather was Deacon John Martin and his grandmother was Sis. Susie Martin, a faithful member of the Missionary Society. Under his leadership, the congregation experienced tremendous growth, most notable are the souls won to Christ. He led them in erecting a new church edifice in which the Friendship family entered in March of 1984. Just 9 years later, he led the congregation in liquidation of the mortgage. 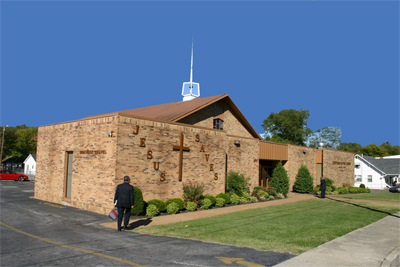 In 1995, they expanded the church edifice by adding a balcony, an educational wing, enlarged the parking area, and opened the Friendship Christian Learning Center, a daycare center serving the entire community. Dr. Turner was active in denominational work. He supported the Ohio Baptist General Association, the Lott Carey Foreign Mission Convention, and was a stalwart and one of the original founders of the National Missionary Baptist Convention of America. Under the administration of Dr. Melvin Von Wade’s presidency, the trend-setting Early Morning Prayer Service was created and Dr. Turner was appointed to lead the entire convention in prayer and praise. His model endures to this day and has spread to various national, state and district levels. Dr. Turner was a supporter and former board member of the National Baptist Sunday School and Baptist Training Union Congress and during the Parade Day it was not unusual to see him dressed in all white with a matching straw hat. Most of all he was a worshipper. He was bapticostal before the name became popular. He was old school but he was a praiser and a dancer before the Lord. A very strong theologian and yet in the hallway he had a wry sense of humor. Many of us remember him walking away from a discussion, waving his hands and saying, “shoot . . .” He didn’t just go to a convention and hang out. He was in every session and encouraging others to do so as well. He was beloved in the National Missionary Baptist Convention of America. He leaves to mourn his homegoing his beloved wife, Dr. Robert Turner, his son, George, Jr. and his daughter, Patrice. We regret to inform you that Pastor G. Thomas Turner, Sr., B Th., L.H.D., D.D., the esteemed pastor of Friendship Missionary Baptist Church for 41 years, passed away this morning. Pastor Turner was a spiritual icon recognized globally for his dedicated work in the ministry of Jesus Christ. Arrangements are pending. Please continue to pray for his wife Dr. Roberta Turner, their son George, Jr., their daughter, Dr. Patrice Turner, grandson, Seth and the Friendship Missionary Baptist Church family. For further information, please contact Marcia Brown, Church Secretary at 614-279-0008, fax # 614-279-0424, email address, friendship@fmbcoh.org. Dr. Turner’s own words speak volumes: Click Here (from his church website). 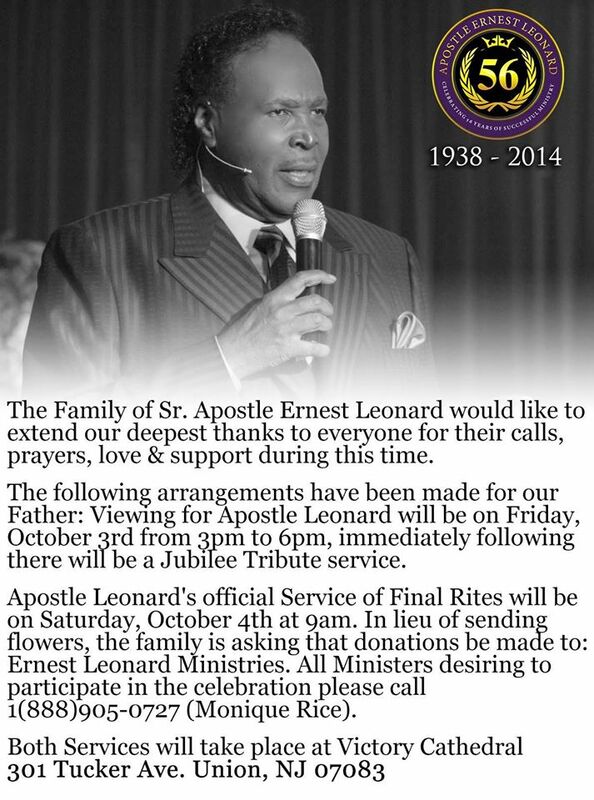 SERVICES WILL BE HELD ON FRIDAY, OCTOBER 17, 2014 AT 11:45 A.M. Note regarding service: Remains will be in sanctuary and no public viewing is planned. 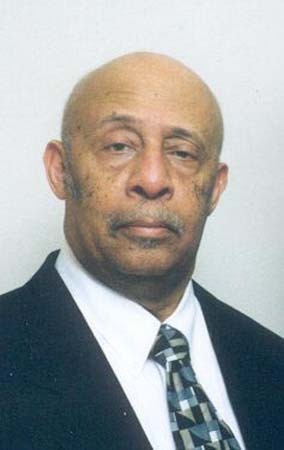 Pastor G. Thomas Turner, Sr., age 77, of Reynoldsburg, Ohio, passed on Wednesday, October 8, 2014 at Mount Carmel East Hospital. He was born in Columbus, Ohio on December 25, 1936. He received his formal education from the Columbus Public School System and was a graduate of the East High School January class of 1955. During his high school years, he was a member of the track team and held records in the mile relay and 880 relay where the team won District and City championships. 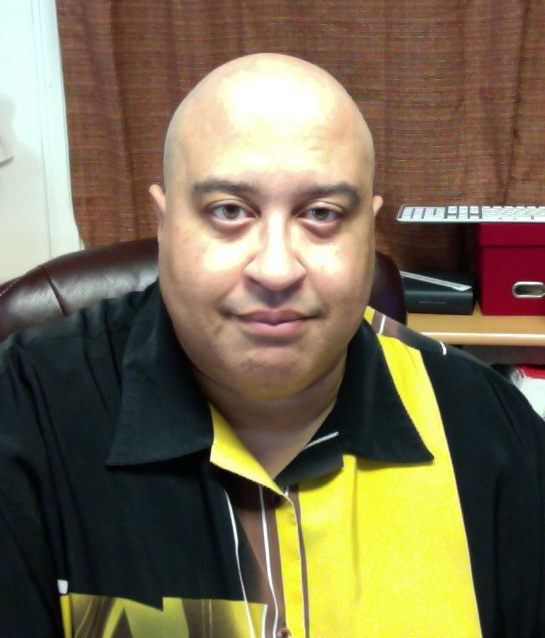 Pastor Turner earned his Bachelor of Theology degree from Virginia Seminary and College in Lynchburg, Virginia; an Honorary Doctor of Divinity degree from Baltimore College of the Bible, Baltimore, Maryland; and an Honorary Doctor of Humane Letters from Virginia Seminary. Also, he attended Capital University, Columbus, Ohio and Shenandoah Bible College, Roanoke, Virginia. 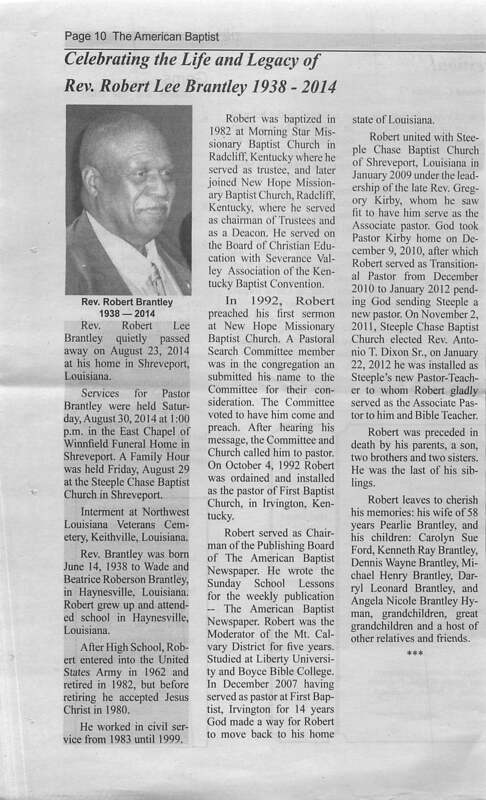 He was a former President and Board Member of Isabelle Ridgeway Nursing Center; an instructor in the National Sunday School and Baptist Training Union Congress; Board Member of the Lott Carey Foreign Missions Convention; a former Moderator of the Eastern Union Missionary Baptist Association and Auxiliaries, Inc.; a former Member of the Board of Directors of the R.H. Boyd Corporation and National Baptist Publishing Board; a founding member of The Brothers of the Common Life where he was referred to as “Dean”; and he was inducted into the Martin Luther King, Jr. Board of Preachers of Morehouse College, Atlanta, Georgia in February 1992. 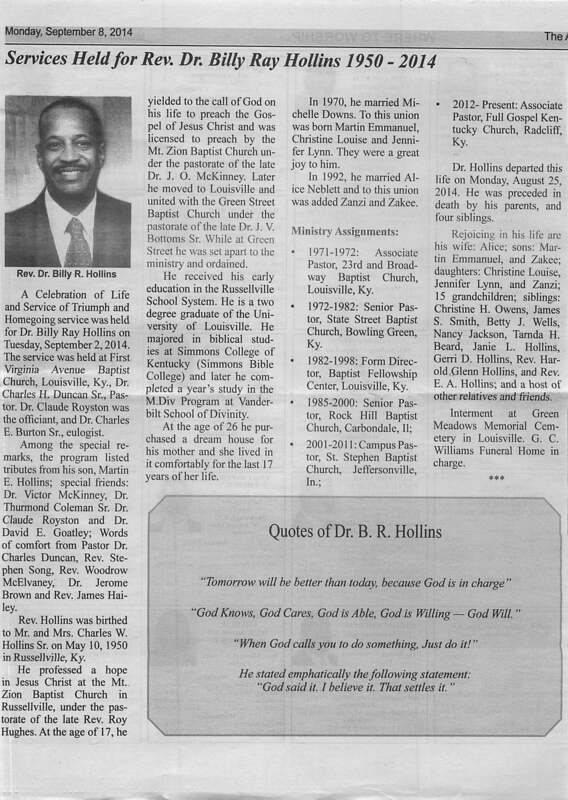 His pastoral experiences included: Macedonia Baptist Church, Cambridge, Ohio; Ebenezer Baptist Church, Kingston, Virginia; Mount Shiloh Baptist Church, Monroe, Virginia; First Baptist Church, Hollins, Virginia; and Maple Street Baptist Church, Roanoke, Virginia. 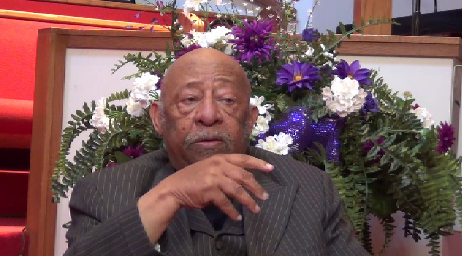 His last pastorate was the Friendship Missionary Baptist Church, Columbus, Ohio for 41 years. Pastor Turner was an avid sports fan and financial supporter of The Ohio State University Athletics Program. He was also a fan of the Cleveland Browns, the Boston Celtics, and the New York Yankees. Pastor Turner is survived by his loving and devoted wife of almost 53 years, Roberta F. Turner, Ph.D.; son, George T. Turner, Jr.; daughter, Patrice E. Turner, Ed.D. ; grandson, Seth; sister, Martha (Richard) Harmon; niece,Trina (John) Branham; nephew, Gary (Tracy) Harmon; many cousins; “special” children: Pat Dawkins and the Rev. Dr. Alyn (Dr. Ellyn) Waller; and the Friendship Missionary Baptist Church family. I am concerned about division. I’m concerned as a believer, as a preacher, as a pastor, as a church member. I don’t like to see nor experience division in the body of Christ. I’m not a proponent of splits especially in our denominational structures that have taken us from one convention in 1914 to well over 20 conventions, reformations, and fellowships in our African-American baptist context. We are so divided it’s hard for any one group to make an impact upon society because of our fragmentation. I’m reminded of when the National Baptist Convention of America split in 1989. I was a young pastor, just started my pastoral ministry in Portland, Oregon and then watched my home convention split and the reverberations spread across the country. Those who had served together for years and many of them icons were now drawing borders and fellowships that had existed for years were now laid bare on the ground. 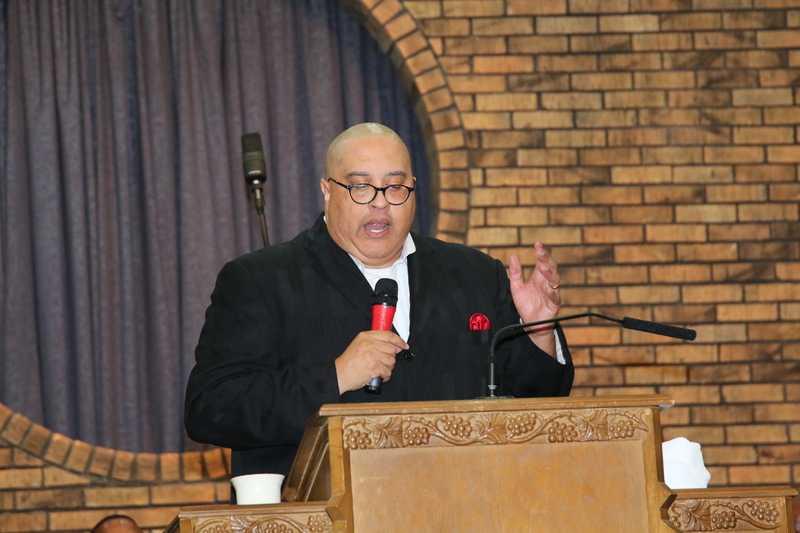 There was an incident that occurred when a pastor from NBCA wrote a pastor from NMBCA and stated that since the National was splitting, a decades long fellowship between the two local churches was no longer in his best interest. I said it then, it was a sad day when we can’t worship together on a local level. However, there is a move afoot and I think it’s worthy of mention that it seems that we are becoming increasingly divided due to stances of theological proportion. Back in the day, E.V. Hill could preach in Los Angeles in his pulpit on Sunday morning, appear on the Charismatic TBN broadcast with Paul and Jan Crouch Sunday evening, fly to Denver to preach to a Focus on the Family event and then wind up at a City-Wide revival at the end of the week. In other words, he had no problem flowing from reformation to reformation. He preached for liberals, conservatives, pre-trib, post-trib, pentecostals, baptists, methodists, episcopalians without any hesitation, in order to spread the Gospel of Jesus Christ. The problem, as I see it, is that many pastors are willing to die on ant hills instead of mountains. We have too much in common in the word of God to sacrifice it on a small list of differences that will either cause us to express disdain or withdraw fellowship because, frankly, what we think is a sacred cow is nothing more than putting personal ideology over biblical practice. Hot button issues aside, we are becoming the Baptist Hatfields and McCoys. I can’t come preach for you because your people shout. You can’t come preach for me because I have women in the pulpit. I can’t come preach for you because you don’t have a higher degree. You can’t come preach for me because you aren’t conservative enough in your theology. I can’t come preach for you because your church is not large enough. You can’t preach for me because all you’ll do is squall at the end of your sermon. And while we play these ecclesiastical games, our churches are thinning out and pulpits are dying. Even if a stance evolves or shifts there is no reason to cut off fellowship completely. I had a friend that was “ride or die” and when I changed a stance, all of a sudden I became an anathema to him. I tried several times to call – not to chop it up theologically, but just to call and say hello. No response. Called several times. No response. So I had to write off a friend that I had worked closely with for many years because of the foolishness of an ant hill mentality. I long for the day when denominations will cease. But I long more intensely for the day when division among baptists will cease.